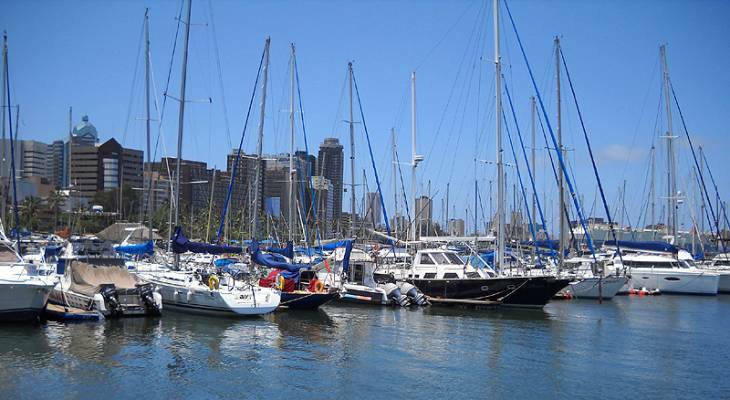 Wilson's Wharf is located in Durban's harbour, and provides visitors with a truly unique experience, not to mention unparalleled views of the harbour. The most notable feature of the Wilson's Wharf is the huge variety of restaurants and food outlets, offering patrons a choice of everything from fine dining to fast food. Within the setup of Wilson's Wharf there is an Oyster bar, the well known Catalina theatre which seats one hundred and sixty five, as well as the Allen Gardiner harbour cruise restaurant, various laid back pubs, and a selection of seafood and international cuisine. Wilson's Wharfside Mall and indoor craft market display a wide variety of quality craftwork and specialty items ranging from leatherware to curios and souvenirs. Visitors to the Wilson's Wharf can complete the experience with a deep sea cruise, which leaves daily from the marina, or for a more energetic type of cruising, there are paddle boats also available for hire. Also located at the marina is a fresh fish market, where visitors can make their selection from the catch of the day which usually includes a full range of seafood. Wilson's Wharf provides the perfect opportunity for good old fashioned relaxation, surrounded by the marina, and working slipways, one can sit down to socialize, enjoy a fine meal and take in the maritime theme, or browse the various shops. Wilson's Wharf Information and Nearby Accommodation.